Introduction: Expenditures in the United States on health care have reached and estimated $2.5 trillion and cost control measures have become major features of the current health care reform debate in this country. An approach to reducing ballooning health care costs has been to focus on quality and uniformity of standards of care using health informatics technology. We have designed and begun early implementation of a web based clinician-to-clinician communication and collaboration tool which permits asynchronous communication among clinicians with the intent to (1) achieve accurate diagnoses (2) involve appropriate consultation and input from specialty service (3) optimize treatment plans spanning disciplines and (4) record careful follow up of the results of multidisciplinary decision making in a virtual environment. Methods: A federal patient privacy regulation (HIPAA) compliant secure platform for communication was built according to specifications designated by clinicians in the Thoracic Oncology Section of UCSF Medical Center. The system was designed with integration of a Picture Archives Viewing System (PACS) and digitized pathology images to permit specific file upload, and annotation in a scalable manner allowing collaborations between two clinicians or among a group as large as 35. Usergroup questionaires and focus groups were performed to refine the computer-human interface and customize user experience. 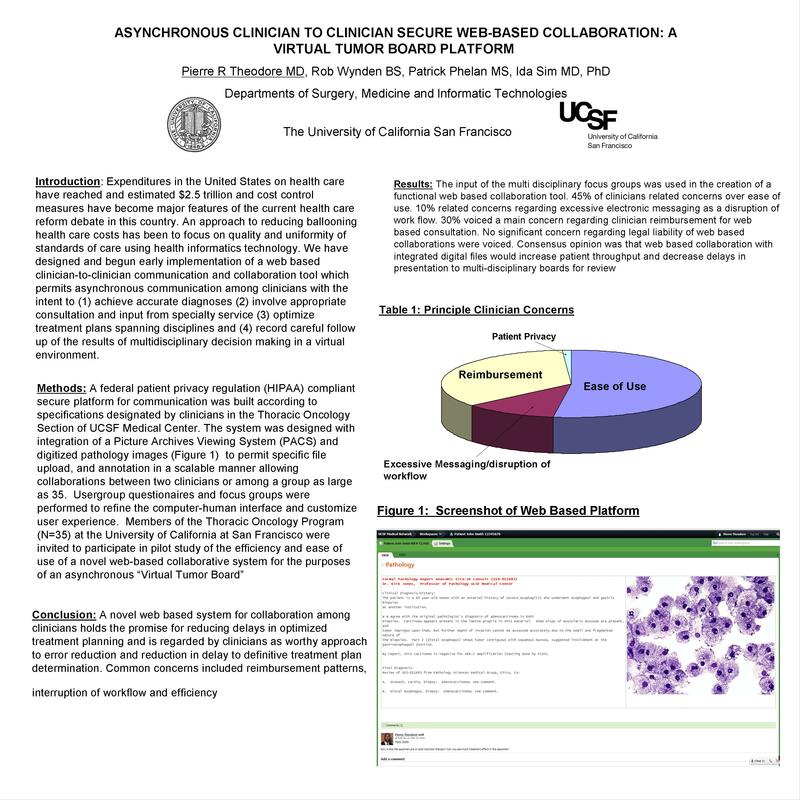 Members of the Thoracic Oncology Program (N=35) at the University of California at San Francisco were invited to participate in pilot study of the efficiency and ease of use of a novel web-based collaborative system for the purposes of an asynchronous “Virtual Tumor Board”. Results: The input of the multi disciplinary focus groups was used in the creation of a functional web based collaboration tool. 45% of clinicians related concerns over ease of use. 10% related concerns regarding excessive electronic messaging as a disruption of work flow. 30% voiced a main concern regarding clinician reimbursement for web based consultation. No significant concern regarding legal liability of web based collaborations were voiced. Consensus opinion was that web based collaboration with integrated digital files would increase patient throughput and decrease delays in presentation to multi-disciplinary boards for review. Conclusion: A novel web based system for collaboration among clinicians holds the promise for reducing delays in optimized treatment planning and is regarded by clinicians as worthy approach to error reduction and reduction in delay to definitive treatment plan determination. Common concerns included reimbursement patterns, interruption of workflow and efficiency.